Breaking news, your LakeCountyEye has learned that Princess Nudelman will be retiring in 2014. Nudelman -- a goldfish (Carassius auratus auratus) -- encountered instant celebrity in 2008 when she became the first inter-species county resident to be registered to vote in Lake County. a month before Barack Obama's election to the White House, she announced her office had received an "unprecedented volume" of voter registration forms with fictitious or incorrect information. 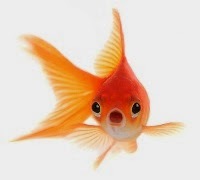 One form had information for a local resident's dead goldfish, Princess Nudelman, Helander said. Her remarks were picked up by the national media and even "Saturday Night Live." The sudden fame led to guest appearances for Nudelman on Saturday Night Live, Deadliest Catch, Lunkerville, as well as a brief stint as a celebrity judge on Dancing with the Stars. Nudelman had exclusive signatory rights on the deal, which included plans for upscale water-park at the reservoir, called NudelLand. Nudelman told your LakeCountyEye that retirement represents an opportunity to spend more time with relatives, and that her near-term itinerary includes swimming back upstream to ancestral spawning grounds in Wooster Lake. In related news, Lake County Clerk Willard Helander will not run for re-election in 2014.